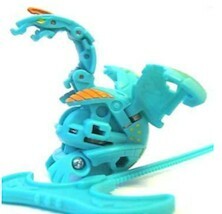 Turbine Helios is a Special Attack Bakugan with the ability to spin in ball form without opening. All Turbine Helios' have a rectangular hole on one side of its body. You may use the ripcord for more than one Turbine Bakugan. It's G-Power has been moved to make room for the ripcord. It resembles a regular Cyborg Helios. Purchase your Turbine Helios from Amazon now!